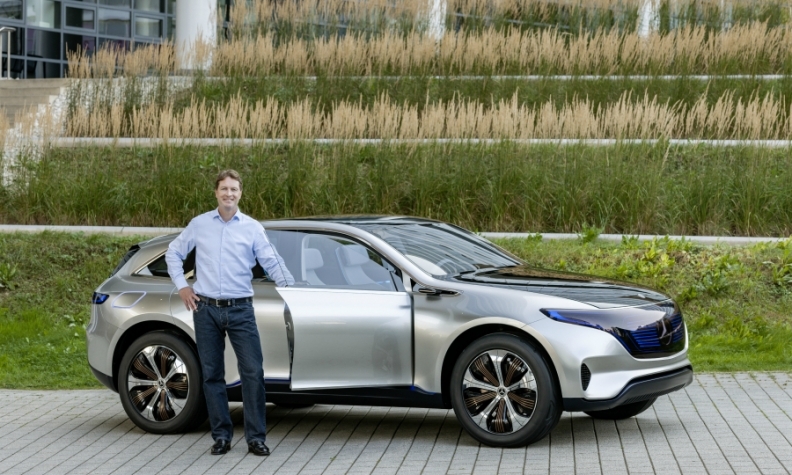 Daimler's new r&d boss, Ola Kaellenius, believes the auto industry is at a major crossroads as megatrends such as connectivity, autonomous drive, shared services and electrification combine to shape the future market. The Swedish executive succeeded Daimler's long-serving r&d chief, Thomas Weber, in January and is considered a front-runner to succeed CEO Dieter Zetsche when his contract expires in 2019. Kaellenius has worked at Daimler since 1993. He is the former head of sales at Mercedes-Benz Cars and has also headed the company’s AMG performance unit. He recently spoke with Automotive News Europe Associate Publisher and Editor Luca Ciferri. Do you believe the automotive industry is at a crossroads? Yes, we are in the middle of a transformation process. There are four technical megatrends shaping this transformation, we call them CASE, which is short for connectivity, autonomous drive, shared services and electrification. The breakthroughs that we have had in the last few years will lead to an actualization of these trends in the next five to 10 years and this could change the face of the auto industry. Does Daimler expect to benefit from these trends? We're in a strong position on every one and we are putting further resources into them to make sure Daimler remains one of the leading companies in the future. What advantage does the diesel still offer in Europe? On the CO2 side, you have a 15 to 20 percent advantage, which is huge. I'm sure there will be more to come with greatly enhanced emissions performance. That's the nature of innovation and evolution. Until 2020 and beyond, it will be crucially important to have the diesel in the mix because this is not a one-discipline game. It's a decathlon. You have to be good at a lot of different things. We see the diesel continuing to have a strong presence in Europe in the coming years. Yes, there is an increasing cost, but the cost of electrification and plug in hybrids is not negligible. Although there are certain different roads that lead us toward zero emissions, which is our ultimate goal, we will still have a combination of powertrains -- full electric, plug in hybrids, super modern gasoline and diesel engines -- for years to come. Is your diesel share between 70 percent and 80 percent of European sales? It's not quite that high overall, but there are markets where it is 70 percent to 80 percent and markets in the 50 percent range. Do you see this going down by 2020 and if so by how much? If we look at what we have experienced in the European market over the last couple of years, we have had no drop in diesel sales and the diesel share has stayed stable. On the new E class that new diesel engine has a very high take rate in Europe. It shows that if you offer something that meets the customers' needs, and of course meets the more stringent emissions regulations and eventually the fuel economy regulations, the customer will decide on the most rational option. Have you given up on diesels in the U.S. market? We're looking at offering it on models where it makes sense and we'll continue to offer diesel where there is demand, but it's a very, very small niche in the U.S. I believe the U.S., as it's always been, will remain a gasoline-focused market. Main challenges: Keeping Daimler ahead of sweeping changes around connectivity, autonomous driving and electrification; managing the expansion of Mercedes' portfolio to more than 40 models. Is artificial intelligence (AI) now emerging as the leading technology for autonomous driving and is it ready? I remember hearing a lot about artificial intelligence 20 or 25 years ago. Everybody was talking about it. Then it went quiet for 20 years, not least because writing line code for every eventuality would end up creating a very thick book that would need computing power like there was no tomorrow. That's why it stalled. In the last three to four years, there's been an absolute breakthrough -- the so called deep neural network software architecture -- where, let's call it layers of rules for the lack of a better word, actually become a learning software. The software can write software and through acting and doing, can learn from that situation. We have had an absolute breakthrough in how you can apply software to address this problem. You still need a lot of computing power but some of the best chip producers in the world now have extremely powerful chips. Let's call them mini supercomputers that can be packaged in a car and are able to process all this information. That's what's leading to the breakthrough. We couldn't have done it the old way. Now the technological building blocks capable of taking on this challenge are really coming together and that's why we see the explorations and hear so much noise about this technique. What do you need for AI in a car to be safe, redundant AI interfaces? In terms of the computing power to run the autonomous system, we will rely on one computer to make it simple. But, for some systems in the car, like steering and braking where in a case of the loss of electrical power you must use muscle power to make sure the car stays on the road, you are going to have to look at redundancies. Will we see a mid-cycle face-lift of the S class this summer and will there be new autonomous driving features added to your flagship? We're coming with more new features on the next S class. For example, I think this is the first time any production car links the map to the sensor data in an intelligent way for an application that you can actually buy. Let me give you one example: Take a curvy highway somewhere in the U.S. where the speed limit is 55 mph (about 80 kph). This highway might have some corners that are so tight that it wouldn't be very comfortable to go through them at 55 mph. Maybe you should go through at 50 mph or at 45 mph. As a driver, you would just slow down. Most assistance systems up to this point, however, can't do that. That’s why we have linked the sensors to the map material. The map knows that you're getting to this corner so it automatically slows the car to the appropriate speed to take the corner and then accelerates to the set speed once you are through the curves. How good is your current semi-autonomous technology at handling curves? One of the challenges with semi-automated drive is radius as a course and exactness. Clearly you don't want to be a meter off and end up with half of your car on the other side of the road. The narrower the corner, the more difficult this is. Our current level of our driver assistance systems, especially at high speeds, could do 80 percent of all autobahns in Germany and maybe 10 percent to 20 percent of the smaller roads. The new system, where we have worked up even sharper and more exact cornering ability and further developed our sensing technology, can now do approximately 80 percent of the smaller highways in Germany as well. Let's take a crossing with a 90-degree turn off the highway. When you turn on your indicator it actually slows the car all the way down and then you take the corner. Is that using the standard definition maps you have from HERE? How important is autonomous driving to Mercedes? We feel that autonomous drive technology is crucially important. It's really one of those technologies that will change driving the way we know it. To have access to a platform like HERE and to develop the mapping material and other use cases around is something that we think is an absolute must. Even on level two semi-automated driving, where the driver is still responsible, you can see that more and more technology building blocks become available on the way to full level four and level five autonomous driving. As soon as we have these building blocks we're ready to put them into serious production right away. That's our strategy. How long could I drive the S class without touching the steering wheel? That depends on the circumstances. We programmed it to go up to a minute, but you will get an audible warning after 30 seconds. In the latest versions, we have worked hard to eliminate misuse cases. As it is with all technologies, some people are creative in figuring out if there is a backdoor. It is our goal to make sure that does not happen and that the technology is used properly. The S class is still at level two autonomy. When do you expect to have a level-three car on the market? Level three will be on the market at the end of this decade. I think we'll see a lot of movement between 2020 and 2025 because a lot of the technology you need [such as the 3-D maps] to get to level four and five is being worked on now. We will have a lot of stuff mapped by the end of the decade so that's a good time frame. Concerning the power of the sensors and sensor development, there's a lot of dynamic development happening there. The sensing technology is getting better and the computing power and the algorithms based on underlying AI technology are also developing fast. So, a lot of things are coming together now that will allow us to move quicker on this topic. A tremendous amount of fragmentation and niche creation has taken place in the last 10 years at Mercedes, BMW and Audi. Will this continue? If we talk about individual body shapes, we're sitting at about 34 Mercedes-Benz models now in our portfolio. We have laid a clear path to go to about 40 in the near future. That means there are still some segments that we feel we could capture. I'm not just talking about niches within niches. I'm also talking about segments with very relevant volumes because we're not doing this for the sake of segmentation. We will only do it if we have a business cases that can make money. Does your 2020 goal include your EQ electric vehicle subbrand? Through the EQ offensive it could go a little bit beyond that. Forty was without EQ so we're talking about 40-plus. But if we see a segment that is not performing and we're not getting the volumes, we don't have a problem cutting a branch off if that's necessary. But, yes, there is portfolio growth still to come and once we're at this 40 or 40 ish, we'll see if there is a market for more. Most of the letters you use to describe your vehicles cover several body styles. The B class is the last one that refers to a single model. Will the B class become a family too or will it disappear as the A family becomes bigger? We have no plans to make the B family disappear. Could we do something more in the B class? Perhaps. Wait and see. Are there too many electronic features on modern Mercedes vehicles that never get used by customers? No, because the approach we're taking is to put the human at the center of things. It's human oriented development and our ultimate goal is to make the experience for the customer going from A to B the best possible experience. If we offer them something they never use, we would stop investing in that thing and move the resources onto something they will use. I'm not saying that you might not want to trim the tree as you go along and let other branches grow. That's very possible. We will increasingly monitor what the customer does and doesn't do and our capability to better monitor what's going on in the car is growing, especially with our new electronic architecture. To serve the customer better I'm sure we will have more personalization or a tailor made approach.